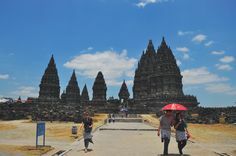 This was the highlight of the trip and we would be spending half a day at Borobodur itself. 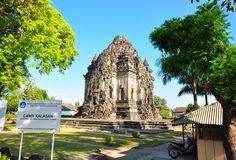 After a longish drive at 3 am in the morning, we arrived at the Borobodur Park and the Manohara Hotel on the ground to begin the morning hike to the temples to be there for the sunrise at 5:45 am. With flashlights, hiking shoes and stick in tow, we headed off in pitch black of the early morning climbing over the precarious stones. In spite of the darkness, I could see the magnificent silhouettes of the Buddhas and stupas looming in the distance and I had to hold my breath in anticipation. Then, after climbing over all the 10 terraces to the very top, we sat quietly, facing east – the mountains ( and the volcanoes of Merapi and Merbabu ) and the sunrise in the distance. We began our morning puja with Brother Tan and meditated, the ancient stones resonating with our Pali prayers. 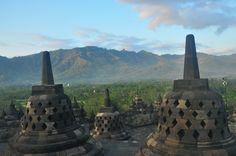 Borobodur – seeing the monuments at sunrise – sings and thrills the heart. Built in 800 CE by the Shailendra dynasty, Borobodur is a Mahayana Buddhist complex of stupas – a gigantic Buddhist monument – at 42 meters or 100 feet tall and a total of 504 stupas in its 123 square meter grounds, it is the largest Buddhist monument in the world. 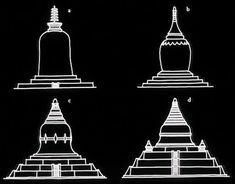 The hundreds of stupas are not just a mass of stones ( laval andesite rocks ) but carved and built ( and all laid without mortar ) on top of a natural hillock, where using the terraces of the natural hills, the builders stacked stones to make these monumental stupas in perfect symmetry and total harmony. 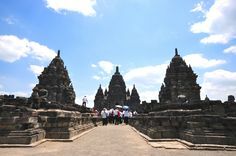 The Borobodur complex is an open monument; there are no chambers ; it has no roof and no vaults, (like Candi Sewu). 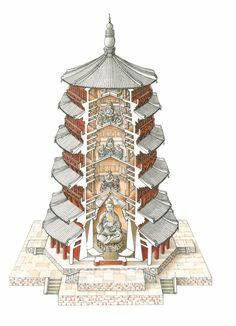 The complex is built in the form of a giant pyramid shaped mandala with 10 ascending layers: the 10 Buddhist worlds represented by the 10 layers. Ascending from the base, there are six square terraces and a courtyard and then, at the top 3 round terraces and at the top, a central main stupa measuring 35 meters from the base or 42 meters tall. The mandala is a diagram representing a spiritual practice of attainment in the Tibetan school of Vajrayana and also in the Sri Vijayan school as well. What type of mandala is Borobodur ? This is difficult to say. There are as many as 3,500 types of mandalas and we cannot precisely fix Borobodur as a particular type of mandala. Each side of the Borobodur complex is 120 feet long and decreases as it goes up. 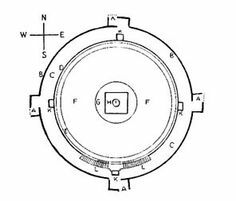 If we were to circumambulate each level, it would encompass a total of 5 km. The entrance to Borobodur is at the east and the Buddhas face east. 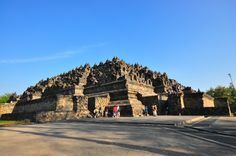 Borobodur took about 70 years to be built by the architect Gunadharma .There is a small hill directly facing Borobodur and folklore says that this hill is said to represent the sleeping body profile of Gunadvara. There are a total of 504 stupas in the entire complex, each stupa enclosing a life size stone Buddha. However, many are now empty due to pillage. Remarkably, no Buddha image is the same, each Buddha image faces all various directions and with various hand mudras with all the 6 types of mudras all represented. The 3 upper terraces have 72 Buddhas; the lower terraces have 432 with total of 504. All the numbers add up to the number 9 ( the largest single digit indiger ). 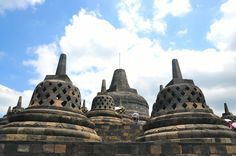 All the stupas have the stocky bulbous Central Java shape. 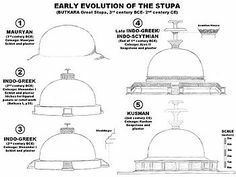 Each stupa consists of the top or harmuca which holds holy relics relic holding top and the main body or anda sitting on a lotus base. 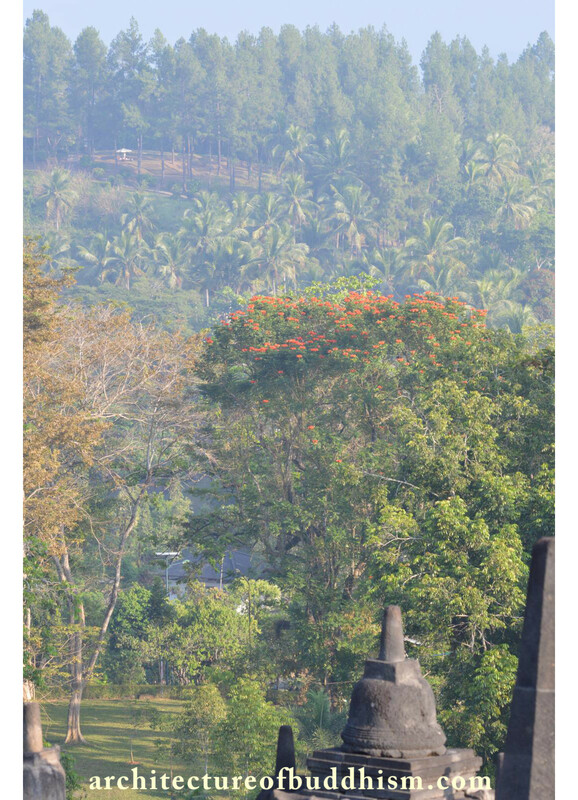 But, not all stupas in Borobodur look the same. The stupas in the upper and lower terraces are differentiated by the harmuca and the anda. The stupas of the lower terraces have octogonal shaped harmuca and the anda enclosing the Buddha have many tiny square shaped openings or holes. 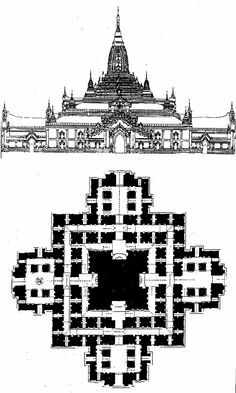 However, the stupas of the upper terraces have a square shaped harmuca and diamond shaped openings in the anda. The base of each stupa equals the height of the stupa. Absolutely perfect symmetry! 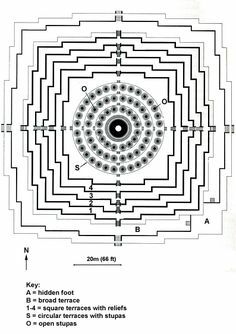 In fact, all measurements from every corner and the height of all stupas of Borobodur are governed by this perfect symmetry. The main central stupa at the top which measures 42 meters is still in the process of restoration – the top has not yet been restored – and is missing the 3 layers of the parasol or ‘chatra’ as can be seen at the Sarnath temple in India. After the sunrise, we climbed back to the Manohara hotel for breakfast and a rest then proceeded after that to go back up to climb Borobodur again ! This time, we were treated to an amazing lecture by Brother Tan on some of the many Mahayana bas relief panels covering each of the 10 layers of terraced carvings. 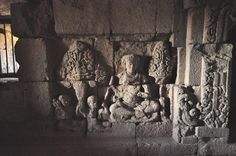 Each gallery being absolute masterpieces of Sri Vijayan or Gandaran art. 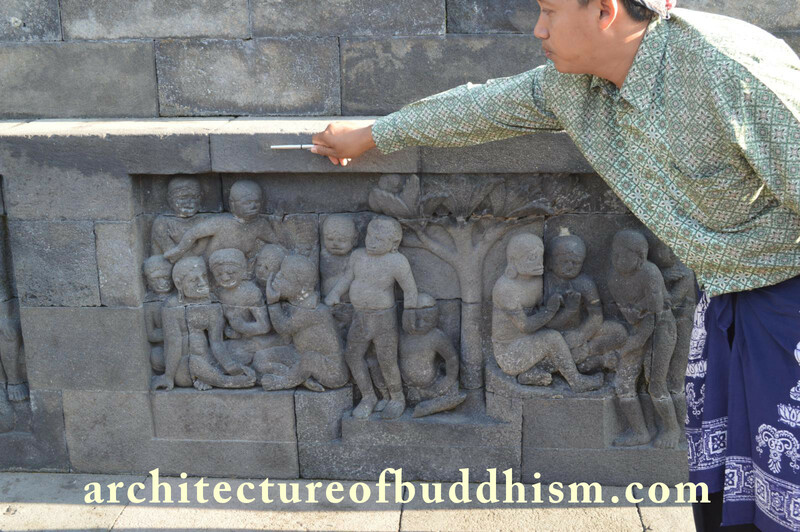 No one panel is the same, each gallery in each layer representing different Jataka stories and as one goes further up the galleries, the Jataka stories brought to life by the panels get from the ordinary to the more conceptual and spiritual. 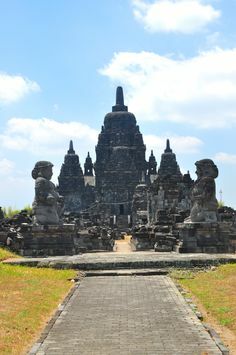 Borobodur was built in 830 CE and was abandoned in 938 CE. 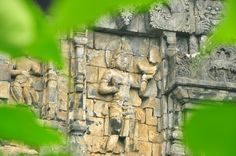 No one quite knows why except that it could have been a massive volcanic eruption when 1.3 meters of ash covered everything and Borobodur (like Angkor) was hidden by this ash and the all-pervading silent jungle. 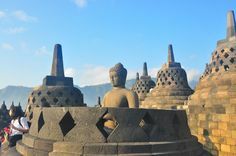 Theodore Van Erp rediscovered Borobudur in 1907 and began the long restoration process, which has led to the site now being UNESCO protected and maintained. 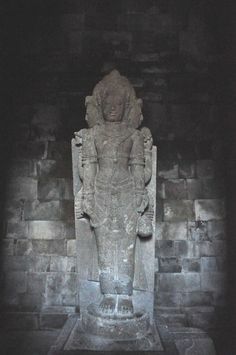 In any event, the champions of Buddhism, the Shailendra dynasty was chased out of Java in 825 CE and this meant that for the next 30 to 40 years thereafter, the royal patronage for Buddhist temples in java was lost. After the Shailendras were removed, the Sanjayan family which was a Hindu princely family still continued to support Buddhism but it began to wane. 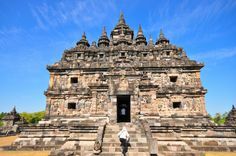 As the Borobodur complex was being built from 830 CE to 938CE, archaeologists discovered that it could have been revised by as much as three times from the original plan. 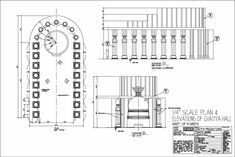 In any event, there were no blueprints then and restorers can only surmise by taking apart the stones and putting them back again. 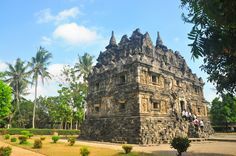 The restoration of Borobodur which began in 1907 ( to 1911 ) by T van Erp was quite thorough and each stone was removed, cleaned, numbered and replaced. This was again redone by UNESCO . 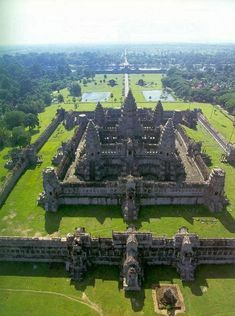 But this time, they put in place a proper drainage system and this has helped to hopefully permanently preserve the Borobodur temples from further water damage – perhaps for the next thousand years ??? In the restoration process they had to build a false footing all around the base because when the restoration began, they discovered that the stacks were so unstable the entire complex may cave in. 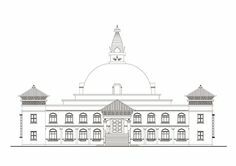 As a result, the base was broadened with the false stone footing. This has meant that sadly, many beautifully carved panels on the base had to be sacrificed and covered over with the reinforced new stone base.